This is one of those books which premise I thought was great. William Barrow has a secret, a big one. He is in fact Judas Iscariot, damned to eternal life. He believes that if he can find the 30 silver coins that started all his trouble, and which happen to be shattered all over the world, he will be able to buy death and an afterlife. To me, that sounded very interesting. Unfortunately, the search for the coin, in Iran of all places, disappointed me. The real search only commences around 80% in the book, and the search is not that much of a search as the coin 'calls out' to William/Judas and he has a lot of help. Instead a lot of the book is spent doing some work for the CIA and a search for a holy grail, and those kind of novels are not my favourite. Even though some discoveries are made earlier in the book, it left me with the feeling I'd expected more from it after reading The Actuator series, which Aiden James co-authors. 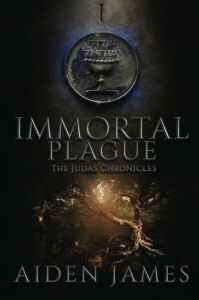 I just hope the next book in the Judas Chronicles will be better.